Lucretia Council Cochran Chapter, NSDAR, meets in Arlington, Texas. The National Society Daughters of the American Revolution is a non-profit, non-political, volunteer women's service organization dedicated to promoting patriotism, preserving American history, and securing America's future through better education. 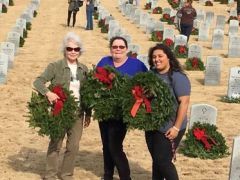 Lucretia Council Cochran Chapter, NSDAR, promotes the National Society's objectives of historic preservation, patriotism, and education through a variety of programs and activities. Many opportunities are available for participation. The regular meeting time is at 10 a.m. on the first Wednesday of the month, September through May. Several Saturday meetings are held during the year. Contact us for information. 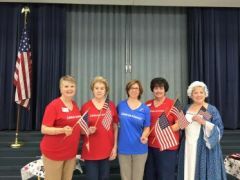 Lucretia Council Cochran Chapter, NSDAR, is a proud sponsor of Three Forks of the Trinity Society, Children of the American Revolution (C.A.R.). Members learn to become leaders of tomorrow through fun activities about American history and heritage. The 2016-2017 Texas State Project is the placement of a Texas State Children of the American Revolution (T.S.C.A.R.) dedicated park bench and the planting of a tree near the site of the TXDAR Patriot Monument at the Texas State Cemetery.